If your design isn’t already in the scene, click on File in the top left hand corner and click on Import to import the design into the scene. Once imported, you may find that your design is too large (or too small). In the sidebar menu to the left of your viewport there are as series of tabs. Click on Tools, and then click on Scale. Navigate to the re-size section to change the scale of your design accordingly so it fits within the scene camera’s view. 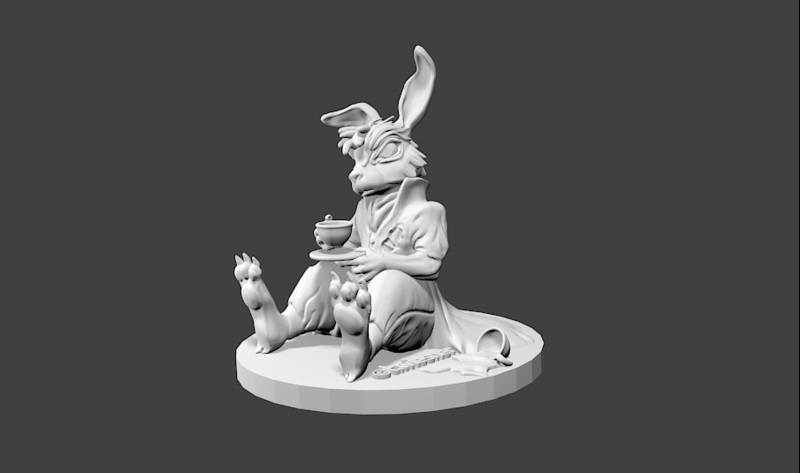 In the case of the March Hare design, I scaled down the design by 0.5. To bring up the camera view, navigate to the bottom of the viewport. 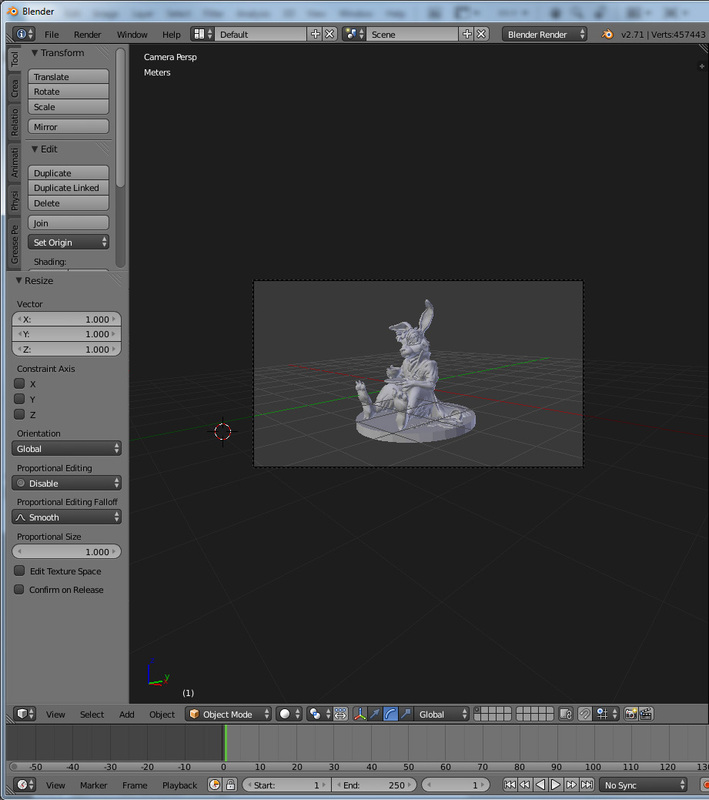 In the menu below the viewport click View and then click Camera. Or on a NumPad, tap numpad 0. When importing designs from other applications, the design can sometimes be imported with a glossy material. For this tutorial, we want a matte material. 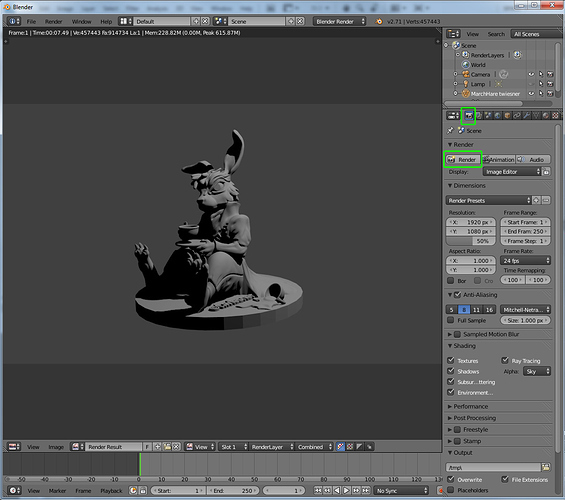 Navigate to the inspector on the far right of your viewport(s). With your design selected, click on the material icon in the sub panel tabs located under the hierarchy. In the panel click new to create a new material. The new material will then be applied to the selected design. Navigate down to the Specular rollout and lower the intensity to 0. If you wish to change the color navigate to the Diffuse rollout. 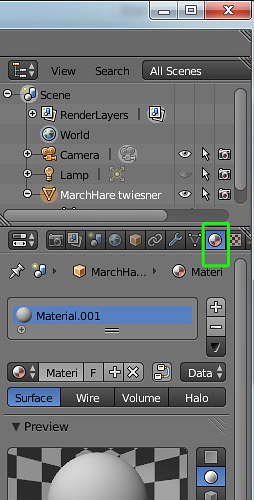 In the same menu panel as the Material icon, click on the camera icon to bring up the render panel settings. Under the Render rollout click render. Straight away we can see what the design looks like with only default lighting. In the panel tabs on the left side of the viewport, click create. Navigate to the lights selection and select a Area light. With the transforms tools, orient the light to the front and left of the design. On the Z- axis, move the light up so it is about a high or higher than the design. 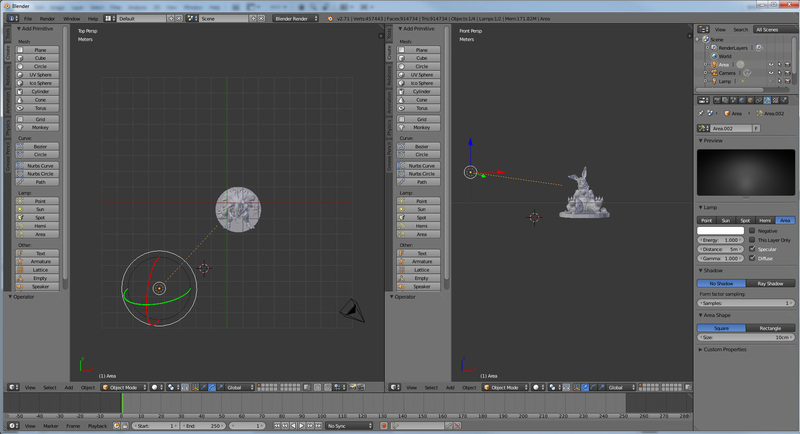 Then rotate the light so the direction points towards the design and slightly downwards. With the light selected, go back to the to the inspector on the right of the viewport(s). Click on the light icon in the sub panel tabs located under the hierarchy. Change the light energy to 0.700. Looking from the top viewport, change the distance so the beam touches the edge of the design. 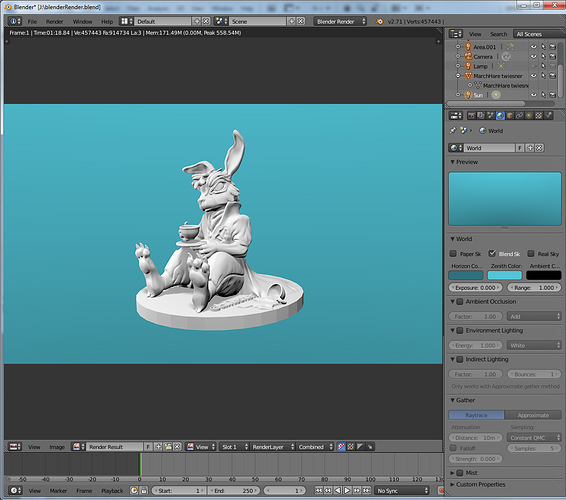 In the case of the March Hare design, a distance of 5 Meters works. Leave shadows under the shadow rollout to No Shadows. Create a second Area light. With the transforms tools, orient the light to the front and right of the design. On the Z- axis, move the light up so it is about higher than the design and higher than the first light. Then rotate the light so the direction points towards the design and downwards at about 45 degrees. Go back to the light settings panel. Change the energy level of the second area light to 0.300. Again, change the distance of the light so the beam touches the edge of the design. Leave No Shadow on. For the third light, we are going to want to add a sun light. Position the sun light near the second area light location. On the Z- axis, raise the light higher than the second area light and rotate the beam downwards. Under the light settings change the light color for the sun to be 0.828 on the RGB Values. Under the shadows rollout, click on Ray Shadow. Change samples to 50. Soft Size 1 m. And use Constant QMC. 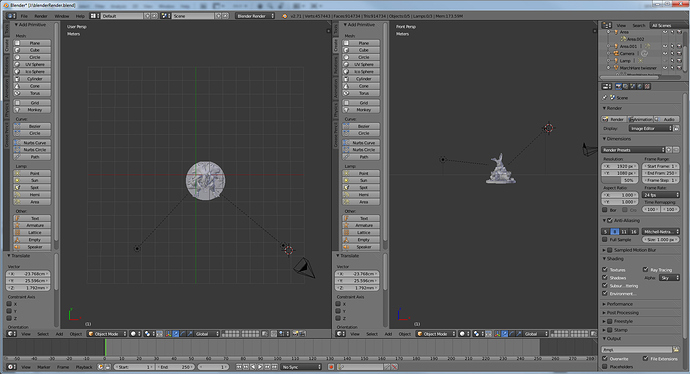 Before rendering go into the hierarchy and click the camera icon next to the light called Lamp. 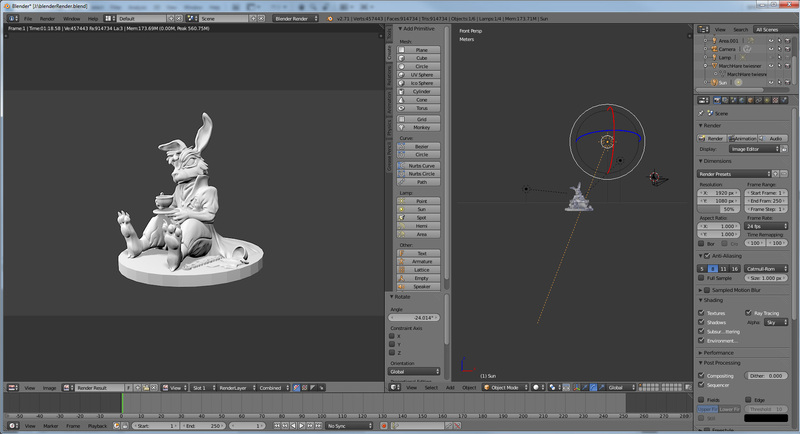 This will turn the lamp off and will not be used in the render. 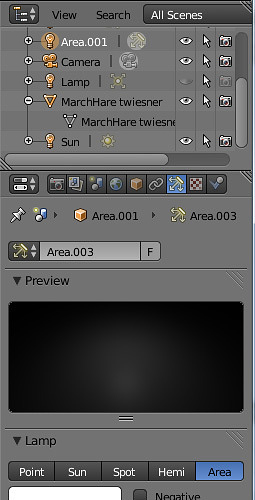 Click on the camera icon in the inspector sub panel menu to bring up the render panel settings. 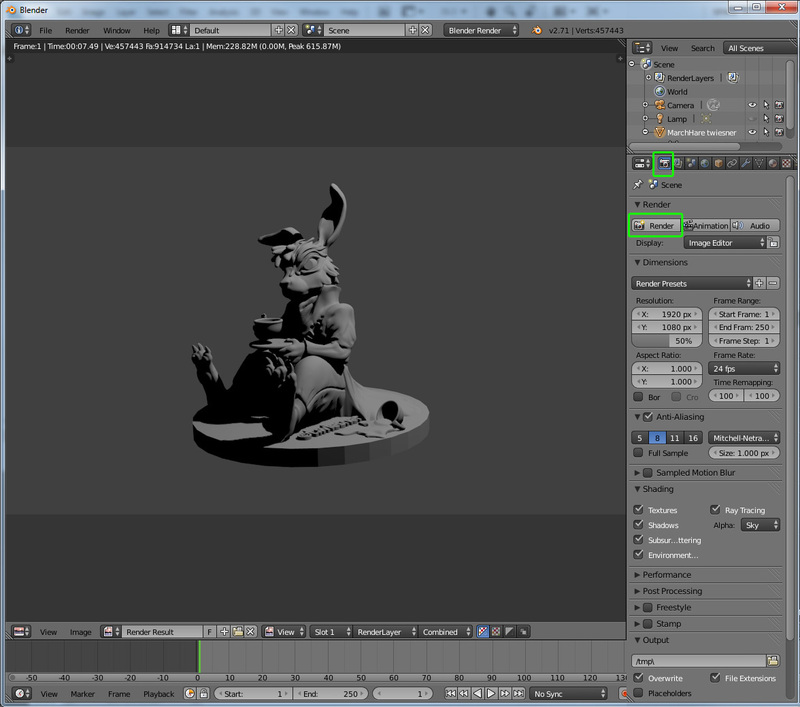 Under the Anti-Aliasing rollout, change the renderer from Mitchell - Netravali to Catmull-Rom. Under the Render rollout click render. 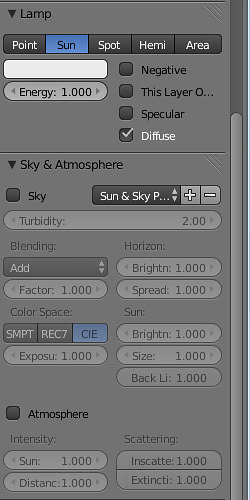 To change the background color, in the inspector sub panel menu click on the globe icon. Here you can change the background to your render as well as any other global render settings such as ambient occlusion.